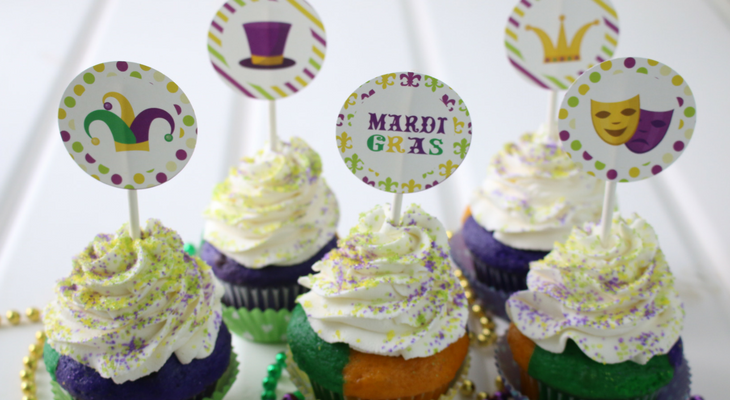 Fat Tuesday is in a few days…do you celebrate? 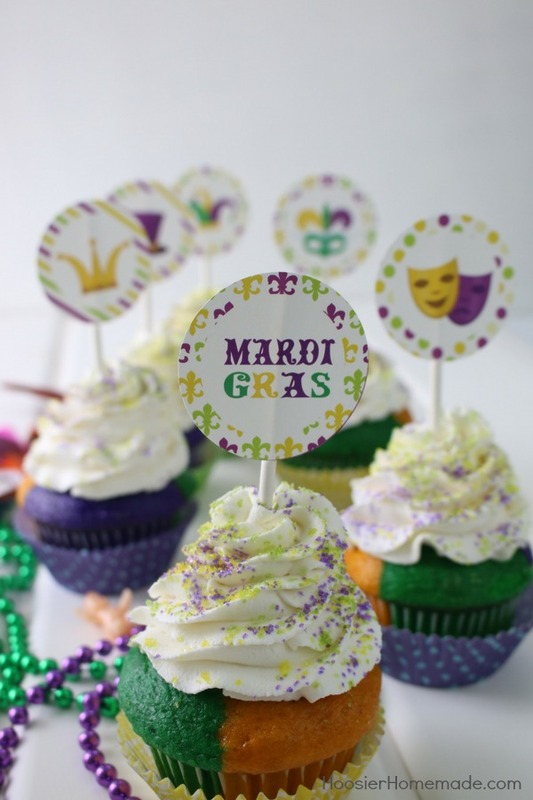 These Mardi Gras Cupcakes boast the three colors of New Orleans – purple, green and yellow, then topped with a luscious whipped cream frosting and topped with a fun Mardi Gras Cupcake Topper that you can grab for free! These cupcakes were really fun to create. They were very easy, but turned out impressive (in my opinion). I started off with prepared cake mix (here is my favorite way to doctor boxed mixes!) and then divided it into three bowls. 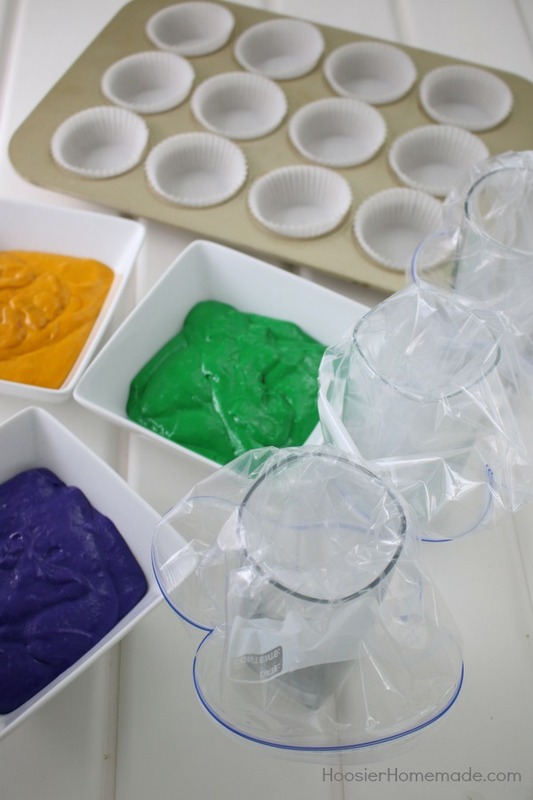 Add purple, yellow and green food coloring (one color for each bowl). Wilton colors are my favorite- I used Violet, Buttercup Yellow and Kelly Green. 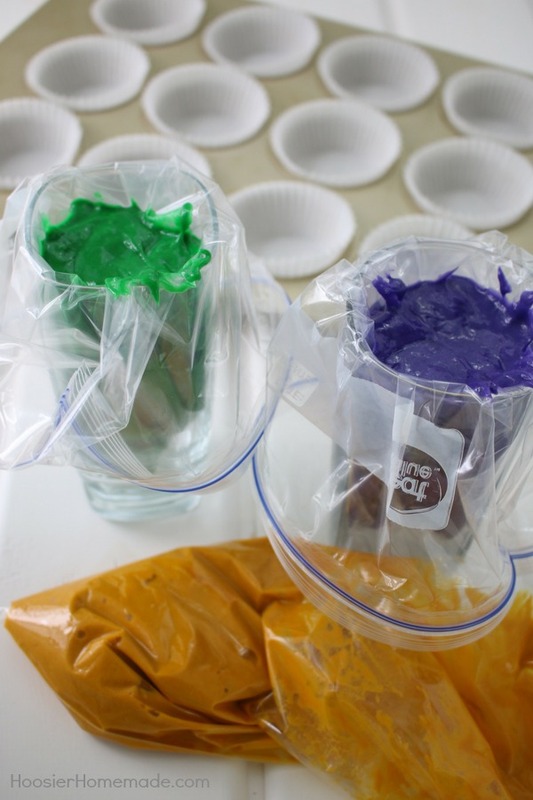 Next, make your “piping bags,” by adding a resealable bag to three tall glasses. I have found that using a decorator bag is easier than the resealable bag, but I didn’t have any on hand. Fill each bag with a different color. Snip off a corner- but be careful- it will come out quickly! I like doing this part with an extra set of hands- the colors are much more even if they are added at the same time. If you have three people, each of you will work on one cupcake liner at a time! If you don’t, try it yourself with all three at once! Once they come out of the oven, it is time to decorate! I used Whipped Cream Frosting on these (recipe below) because it is so light and fluffy! Then I decorated with sanding sugar- lavender, green and yellow! And, of course, cupcake toppers! You can grab yours for free RIGHT HERE! How do you celebrate Mardi Gras?? 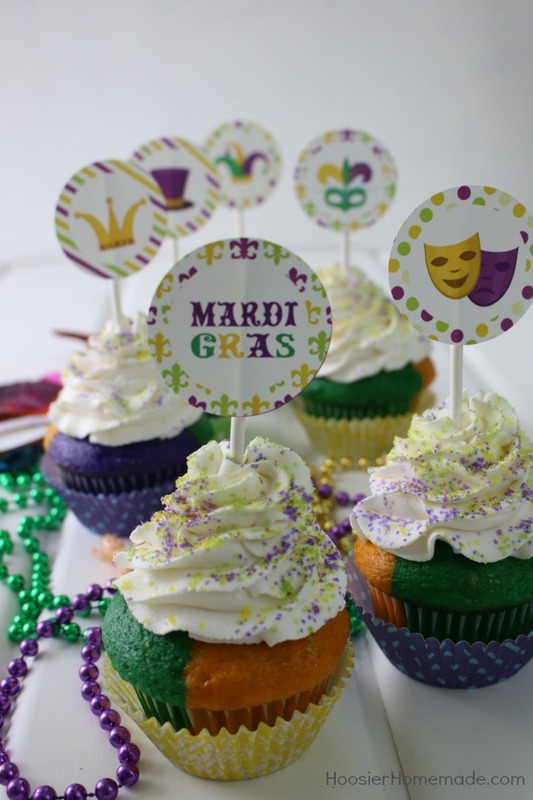 Do you celebrate Mardi Gras? 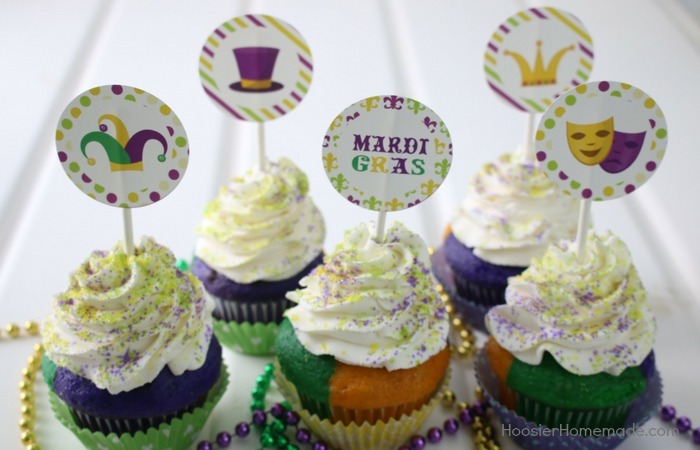 Would you like a King Cake Cupcake recipe? 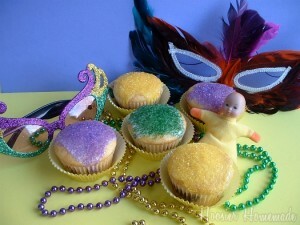 You may also like my King Cake Cupcakes and Mardi Gras Food ideas! Gator Gal from Cajun Country will be making these for her Mardi Gras guests at the Bienvenue House Bed and Breakfast (www.bienvenuehouse.com). Great idea for the individual guests. May I suggest that you use the traditional Mardi Gras colors as with the celebration there is important meaning and cultural rituals. I just finished making these, I used a mini bunt cake pan and made 3 colors of icing (yellow, blue and green) and drizzled it on top of them. They are super yummy and adorable. Thank you for the great idea!!! I’m so glad to hear that Christina! Very cool ideas! Feel free to share them on my Facebook page. Definitely going to share with my readers & try them out myself, they look so, so good & easy to make, I can’t wait to try!!! Thanks! These look awesome! I have 2 little helpers that love to bake with me so we will definitely be trying these! Thanks for sharing! 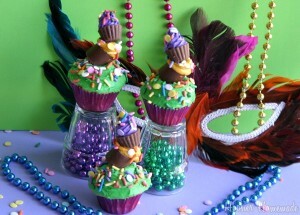 Adorable … I will definitely be making these for Mardi Gras next year! AWESOME! 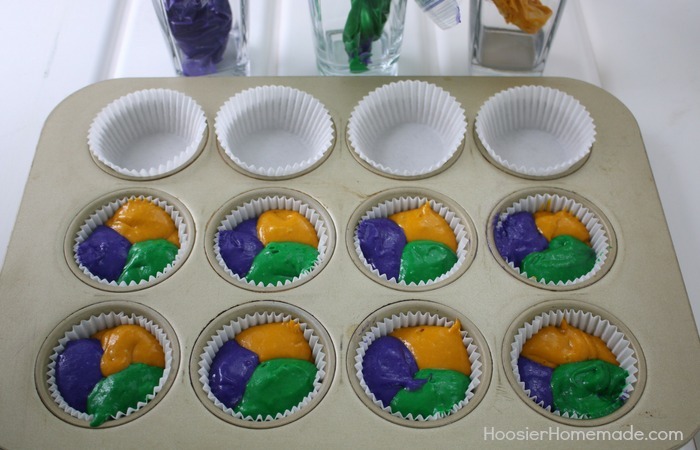 I live in Louisiana and I don’t really like king cake much, but cupcakes would be so much easier and not as sweet! I will try to do these for Easter! I think you can make these for any holiday and for birthdays, etc. You could try putting the three bags into one large bag… that is how we make striped icing.. I live just outside of N.O. and think your Mardi Gras cupcakes are fabulous. Thanks so much Patsy! Have a fun time! These are so neat. You are always impressing me with the creative cupcakes you make! These are so festive! I love it!!! These are so cool! I really like the vibrant Mardi Gras colors. Now I just need to get my little helpers in the kitchen with me. Love your cupcakes. They go perfectly with my Mardi Gras Mask! I don’t really celebrate Mardi Gras but I think it looks fun and very festive! Oh my. How yummy do those look???? These are awesome! I’d be honored if you linked them up with Sweet Tooth Friday.